Looking for a quick and easy dinner? I love making chicken roll-ups! There are so many great options to stuff them with but a really healthy one I did tonight was spinach, sun-dried tomatoes and fat free mozzarella cheese. All you have to do is take the chicken breast and pound it flat. 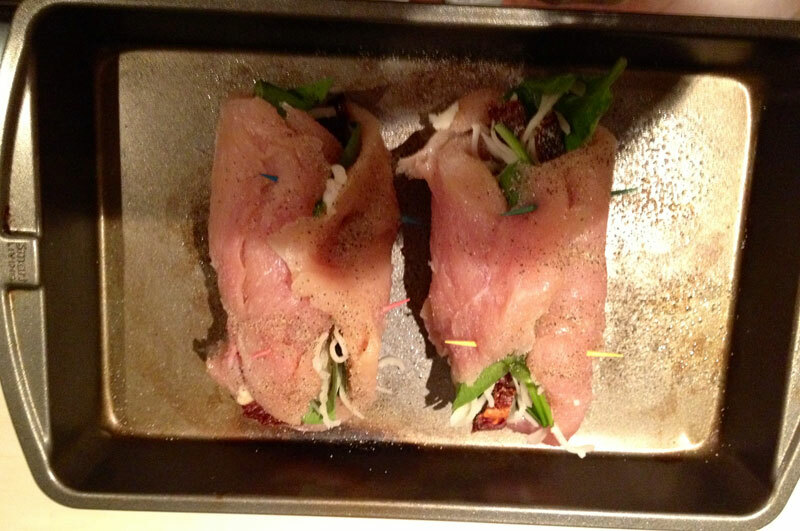 Then I added some pepper and a little bit of garlic salt. 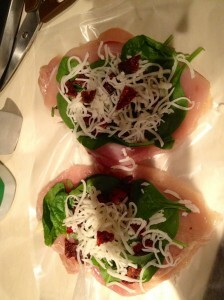 Next, I topped it with spinach, sun-dried tomatoes, and fat free mozzarella cheese. Then simply roll it up and secure with toothpicks. I sprayed a baking dish with a little Pam, added a layer of pasta sauce, and then cooked the chicken for about 35 minutes at 400 degrees. Use your own judgment on this cook time and temp though because on the motorhome, we have a convection oven and the temperatures are a little funky. Halfway thru I put a little pasta sauce on top. Once it is complete I topped it with a little more pasta sauce (whichever one is your favorite), a few more sun-dried tomatoes and a little sprinkle of Parmesan cheese. Volla! Instant, yummy, healthy dinner!